or in a small bowl. to preserve their color. Dry on paper towels and set aside. - Mix all the ingredients for the dressing, beginning, with the salt and pepper (the salt will thus be dissolved when the dressing is ready). and add to the dressing. - Toss the mesclun with the dressing. 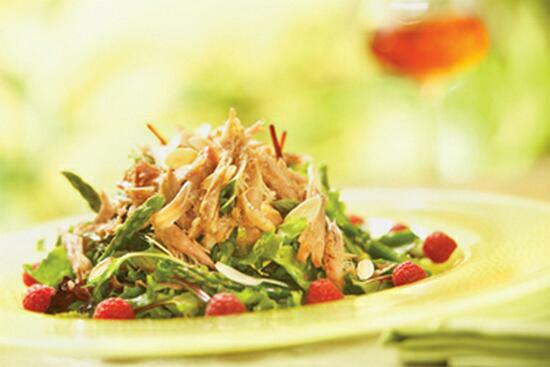 - Place the warm shredded duck confit on a bed of mesclun, garnish with almonds and decorate the plate with fresh raspberries. Note: If you wish to serve this salad as an entrée, place a warm whole cooked duck confit on a plate with a portion of the salad with asparagus and raspberry dressing. Sprinkle the salad with grilled almonds and decorate the plate with fresh raspberries. As a variation, heat a boneless duck breast confit according to the package instructions and slice into thin strips to garnish your salad.